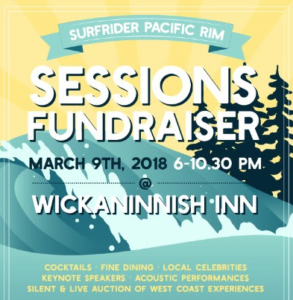 Surfrider Pacific Rim is excited to be organizing the first annual “Surfrider Sessions” fundraiser hosted by the Wickaninnish Inn on March 9th, 2018 from 6:00 pm – 10:30 pm! This exclusive event will feature keynote speaker Chris Pallister – known as the “Godfather of Marine Debris”, local celebrity MC Krissy Montgomery, live music from Vince Vaccaro and an amazing silent AND live auction featuring west coast experiential auction items including kayaking and seaplane tours, as well as an array of art from some of the talented people of the coast and so much more! Expect ocean-friendly straw-less cocktails featuring Sheringham Distillery’s Seaside Gin, delicious canapés, interactive Surfrider stations, and of course an opportunity to peruse the wonderful silent auction items and begin bidding! A three-course delicious sit-down meal with paired wines from The Pointe Restaurant Culinary Team will be served and devoured by all. Following a keynote address, the silent and live auction will continue with TWO live music sets by Vince Vaccaro. Surfrider goodies for everyone! There will be 50 of tickets only for this exclusive event – don’t miss out! All proceeds will benefit the Surfrider Pacific Rim Chapter. Join this highly anticipated event and contribute to Surfrider Pacific Rim’s efforts in protecting the ocean, beaches and waves throughout 2018! Contact specialevents@wickinn.com to purchase your tickets now, priced at $150 each. Thank you to all sponsors including but not limited to Wickaninnish Inn, Sheringham Distillery, Tuff City Radio, Claire Watson Art and the many businesses that have donated so far to the fantastic selection of prizes for you too bid on and cherish!